Summer camp’s extreme popularity among the youth has been growing since summer camp got its start in 1861. Nowadays over 12 million kids attend camp every year! With numbers like that, it’s not too surprising to discover that a lot of former summer campers are now famous celebrities! In fact, it’s likely that summer camp helped them find the path that led to their fame! 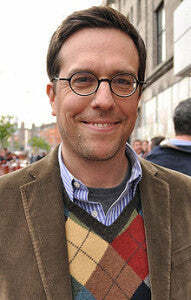 Ed Helms—best known for his role as Andy Bernard (a.k.a. The Nard-Dog) on the hit television program, ‘The Office’—was a summer camper himself back when he was a youngin’. Attending Camp Carolina, Ed spent his camp days exploring 220 acres of the Blue Ridge Mountains as well as 450,000 acres of the bordering Pisgah National Forest. The youngest in his family with two older siblings, Ed had a fun childhood outside of summer camp as well. He had to grow up quickly, however, when he had open-heart surgery at just 14 years old! The procedure fortunately corrected a severe heart murmur that threatened young Ed’s life! He attended The Westminster Schools alongside his buddy Brian Baumgartner. The two didn’t know it at the time but they would end up working together on ‘The Office’. Brian plays Kevin in the show! When he went to Oberlin College, he started as a geology major but switched over to film theory and technology before long. And he graduated in 1996 and immediately began to establish a career in comedy and acting. He wrote with sketch comedy bands in New York City and studied improv with the Upright Citizens Brigade—a well known improvisational troupe. He also found work as a trainee film editor at a post-production facility in New York City. There, he recorded some rough voice-overs that eventually brought him paid voice-over work. And this led to Ed finding his talent agent. Work started coming in for Ed then and it wasn’t very long before he was brought on board as Andy Bernard in the mockumentary style show, ‘The Office’. The writers of the show created Andy—someone who Ed had a lot in common with. Like Andy, he is obsessed with a capella music, despite his proficiency with musical instruments such as guitar, banjo, piano, and even sitar. Very into music, it’s no surprise to learn that Ed formed a band during his time at Oberlin College with his friends Ian Riggs and Jacob Tilove. The band still plays shows about once a year and put out their first album a few years ago. Celebrated for his work, Ed was asked to deliver the convocation speech for Cornell University, Andrew Bernard’s alma mater! Summer camp got Ed going on the right path. What kind of path will camp put ahead of you? As always, thanks for reading!